The 2015/2016 EPL was a big surprise to everyone, but as we head into the 2016/2017 season, everyone is wondering if Leicester City will repeat their heroic feat. Some are even asking if this is going to be the year that Spurs will overtake Arsenal and claim the London Glory. The latest premier league betting odds to win league show that Manchester City is the favorites to win the premier league title at odds of 9/4. Manchester United at odds of 3/1 closely follows Manchester City. Current champions, Leicester City, are predicted to win the title at odds of 28/1, further behind are Liverpool FC at odds of 8/1, Arsenal at odds of 11/2 and Tottenham Hotspurs at odds of 9/1. From the analysis conducted, Manchester City is set to win the title given the recruitment of their new coach Pep Guardiola. They’ve also made significant signings this summer, who are set to boost their quest for the title. Arsenal is set to be the main rivals of Manchester City in their quest for the title having maintained all their key players as well as adding new signings to the team. Others may argue that Manchester United are the favorites to win the title given Jose Mourinho's experience and record of winning titles in his first season with the team. At odds of 8/1, some may say that Liverpool will astonish people having made very important signings which will boost the team. Further, they only have the EPL to focus on and have the right coach and team to achieve this. Another popular market offered at SkyBet is the top 4 finish spot, which mainly features teams that will finish in the top four. Usually, there are the “top four” teams that are “automatically” guaranteed to have a spot in the top four and consequently have very low odds at some of the betting sites. Manchester City, Manchester United, Arsenal, Chelsea, Leicester, Tottenham Hotspurs all have been tipped as favorites to win. Defending champions Leicester have odds of 5/1 to finish within the top four. Of the mentioned teams, Arsenal has an unbeaten record of finishing in the top 4, having maintained 16 successive top 4 finishes. Manchester City has also had a good run of finishing in the top 4 since ownership was transferred to the wealthy tycoons. Chelsea has been shaky in finishing at the top, having slipped to mid-table in the 2015/2016 season but are predicted to bounce back to their winning ways to secure a top 4 finish. With Manchester United players playing under the “special one,” they are also favorites for the top 4 finish. Liverpool, Spurs, Leicester and West Ham are bound to battle for the fourth spot, with Spurs being the favorites of the four teams to secure this coveted spot. Opposite to finishing in the top 4, the Latest Premier League Betting Odds to Finish outside the top features teams that are most likely to finish outside the top 4. The teams that are featured in this section include the “big four” as well as the “Europa” teams such as Southampton, Everton, West Ham, Liverpool, Leicester and Tottenham Spurs. 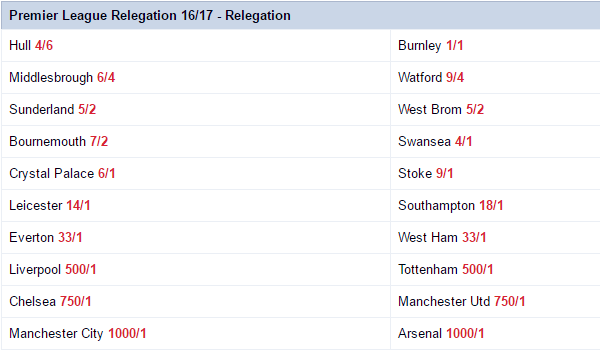 Another popular market among the UK punters, the premier league relegation, will feature some of the teams that have recently been promoted. For example, Burnley has even odds of 1/1 to be relegated; Hull City have odds of 4/6 to face the axe; Middlesbrough have been set at odds of 6/4 to go down, and Watford has odds of 9/4 to face the axe. Having survived last season’s axe, Sunderland FC, who are under a new coach are set to fight for their survival this season again. However, Watford, West Brom, Bournemouth, and Swansea are set to be favorites for the relegation spot having struggled so much to survive in the top tier. 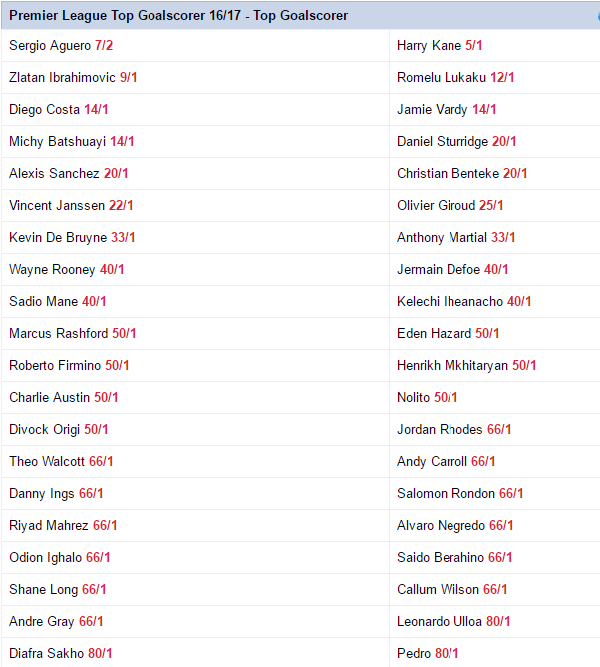 The latest premier league betting odds for the top scorer are as shown below. Unlike the previous years where Sergio Aguero and Harry Kane have always been the favorites, we now have plenty of contenders for the golden boot. Just recently, Manchester United signed up Zlatan Ibrahimović, who was PSG’s and France’s Ligue 1 top scorer as their main striker. Him, together with other players such as Jamie Vardy, Oliver Giroud, Anthony Martial, and Alvaro Negredo are some of the players we think will battle out for the much-coveted golden boots. Specials are betting markets that have been made available on the Sky Bet website so that you can place special bets from the usual betting markets. For example, SkyBet has specials on teams, which will win their first three games; top and bottom three in any order; top three and bottom three in a particular order; team A will finish higher than team B; among many other options. Out of the various special options, I would like to note mention the Premier League highest finishing London club. Chelsea and Arsenal have odds of 6/4; Tottenham have odds of 5/2; West Ham have odds of 16/1 and Crystal Palace have odds of 100/1. Given their recent form and gameplay, Arsenal seems to be the favorites to finish above all the other clubs in London. They’ve always finished above Spurs, West Ham and Crystal Palace in the recent years. Chelsea has always challenged them, but this time, things are set to be different with pundits tipping Arsenal to win the title.